• D. Hunting and Fishing: Game Names, Arms, Trapping, Methods. It includes 5,594 terms, both scientific and common, in English, French, German and Russian and in Latin (for the generally accepted biological terms for European and North Asian plants and animals). 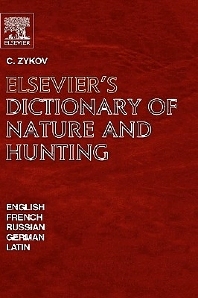 The dictionary was developed with the help of Russian specialists - scientists from the Severtsov Institute of the Russian Academy of Sciences, officials from the Union of the Hunters and Fishers of Russia, and French colleagues from various organizations dealing with environment protection and natural resources: OMPO (Oiseaux Migrateurs du Paléarctique Occidental), ANCGE (Association National des Chasseurs du Gibier d'Eau), ONC (Office National de la Chasse) and CIC (Conseil International de la Chasse et de la Protection du Gibier).